New book, 151 pages. Whether folding a chassis for a piece of equipment, beating or spinning a curved shape, drilling or punching holes or repairing a tank or car panel, the how and why is simply explained in this comprehensive book. 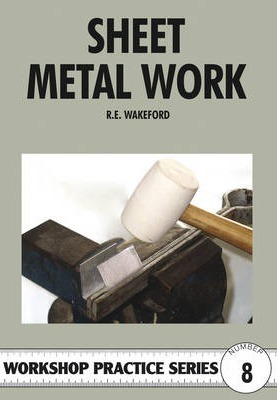 The author, R.E.Wakeford, is an instructor in metalwork and allied crafts and uses his teaching experience to describe clearly all the processes likely to be encountered by the hobbyist or in a model or light engineering workshop. Contents: Tools; Metals and their Characteristics; Marking and Cutting; Shaping Methods; Seams, Edge Finishes, Joints; Soldering, Hard Soldering and Brazing; Rivets and Riveting; Welding; Repair Work; Spinning; Finishing Processes; Sheet Thickness; Judging the Temperature of Metals.